so apparently Spring doesn't exist in this part of the state, it just passes us by. Here in CO we have 4 months of summer and the rest is either cool, cold or freezing. I'm born and raised down in the deep south and prefer warm weather over cold, I still can't adapt and its been six years since I moved here to the mountains. It snowed, again. 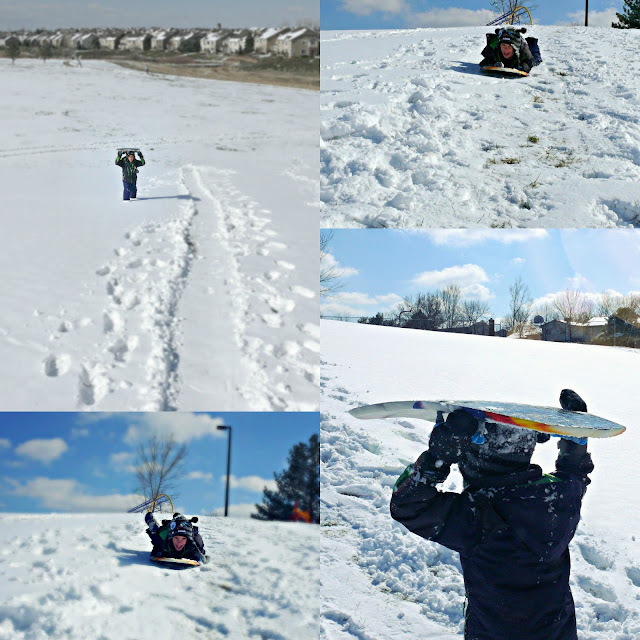 This time something good came of it, Caleb and I went sledding. I have been wanting to do this all year, but it seemed most of the winter either one of was sick and couldn't make it when it snowed. We are both well so we headed out for a little fun, man that look on this kids face was enough to fill my cup. His laughter is contagious and touches my heart. I wish I could be a kid again, to feel no pressure of the world and just have fun. Well, we did today anyways.....we always have today.